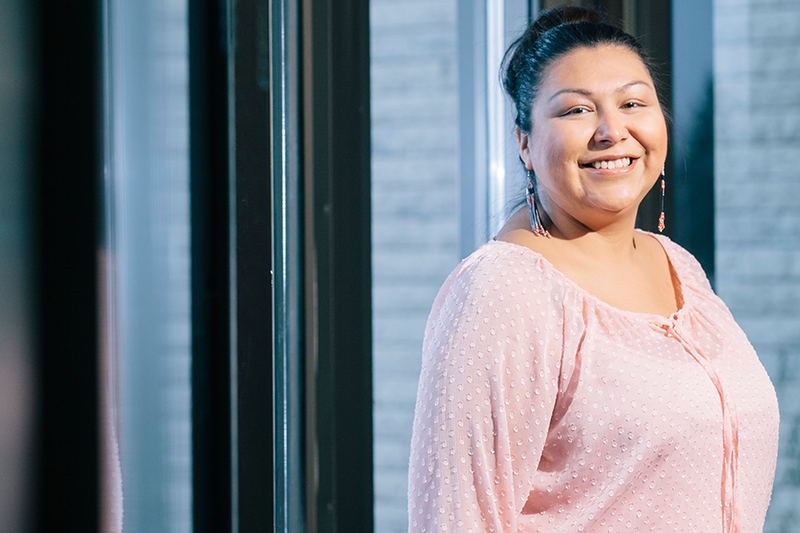 Nicole Callihoo (MPA'14) is funding the All My Relations award, a scholarship available to Master of Public Administration students at both the U of R and U of S campuses (photo by David Stobbe). A recent graduate from the Johnson-Shoyama Graduate School of Public Policy (JSGS) hopes that her gift to her alma mater will encourage future alumni to continue to practice philanthropy. Nicole Callihoo donated $10,000 to the school to create the All My Relations award for students enrolled in the Master of Public Administration (MPA) program at the University of Regina and the University of Saskatchewan, with equal funds going to both campuses. Commencing this fall, one student from each of the University of Regina and the University of Saskatchewan will be awarded $1,000. The student must be enrolled in the MPA program, in good academic standing and demonstrate a commitment to community involvement. Callihoo saw a need for additional funding to JSGS students while she was completing her MPA. She only received external scholarships, an experience that encouraged her to give back and help alleviate some of the financial struggles many students face. She hopes, in turn, this gift will eventually turn into a fund that others contribute to so more students can benefit—recognizing those that have gone before us, those around us, and those to come. "This is my thank you to all those who supported me and especially JSGS who helped me get to where I am in my career," she said. "I think large donations are sometimes hard for people to realize and what they might not understand is by structuring the gift in increments it allows you to work it into your budget." See more on the JSGS website.